(Beirut) – Syrian government and Russian forces have escalated their airstrikes on Eastern Ghouta, a suburb approximately 15 kilometers from the center of Syria’s capital Damascus, killing dozens of civilians in apparently unlawful attacks, Human Rights Watch said today. Syrian forces have tightened their siege of the enclave, held by anti-government armed groups, severely restricting humanitarian aid in violation of the laws of war and preventing civilians from leaving the area. The UN Security Council, which on December 19, 2017, renewed its mandate for cross-border delivery of humanitarian aid to millions of desperate Syrian civilians, should demand that the Syrian government immediately end unlawful restrictions on aid to Eastern Ghouta or face targeted sanctions against those responsible. Syrian government and Russian forces have escalated their airstrikes on Eastern Ghouta, a suburb approximately 15 kilometers from the center of Syria’s capital Damascus, killing dozens of civilians in apparently unlawful attacks. Human Rights Watch in November and December spoke remotely with 12 residents, humanitarian workers, and doctors in Eastern Ghouta concerning alliance airstrikes and restrictions on humanitarian aid. Syrian government forces have besieged Eastern Ghouta, which has a population of about 400,000, since 2013. In October 2017, the government restricted the use of the al-Wafideen crossing, the only entry point for commercial merchandise, depleting scarce food and medical supplies and causing prices to skyrocket. From November 14 to November 30, the Russian-Syrian joint military operation conducted more than 400 airstrikes on Eastern Ghouta, according to the Syrian Civil Defense, a volunteer group that works in anti-government areas, and the Syrian Observatory of Human Rights. The Russian-Syrian alliance struck more than half the towns in the besieged enclave at least once during this period, according to localmedia monitors. Homes, a makeshift school, and a public market were among the civilian structures hit. Human Rights Watch documented three aerial attacks in Eastern Ghouta since November 14 that were apparently indiscriminate, in violation of the laws of war. One incident involved the use of cluster munitions, widely banned weapons that are inherently indiscriminate. These three attacks caused the death of at least 23 civilians and wounded many others. The threat to civilians from the intensified aerial campaign has been exacerbated by lack of access to medical care and essential foodstuffs, Human Rights Watch said. The air and ground attacks and siege have together resulted in the deaths of at least 190 civilians, including 51 children, between November 14 and 30, according to the Syrian Network for Human Rights. The laws of war do not prohibit sieges so long as the harm to the civilian population does not exceed the expected military gain, starvation is not used as a method of warfare, and humanitarian aid delivery is not hindered. Syrian forces have severely restricted the entry of essential food and medicines and the exit of civilians from Eastern Ghouta in violation of the laws of war, Human Rights Watch said. Entry of humanitarian aid through UN convoys has been extremely limited, with the Syrian government only granting permission to the UN to enter a handful of times over the past year. While a besieging force may prevent the entry of weapons and food and other supplies destined for opposing armies, essential goods for civilians must be allowed. A UN official told Human Rights Watch, “the government systematically rejects life-saving medicines and medical equipment.” The UN estimates that aid reached only a quarter of the besieged population in Eastern Ghouta in 2017. The government has also unnecessarily hindered the evacuation of people with urgent medical needs, Human Rights Watch said. The UN said that close to 500 people require immediate medical evacuation and that at least 10 people have died since June while awaiting Syrian government permission to leave Eastern Ghouta for treatment elsewhere. UNICEF, the UN children’s agency, reported in December that 137 children, ages 7 months to 17 years, needed immediate medical evacuation. Infighting among anti-government armed factions and restrictions on freedom of movement within the enclave have contributed to worsening humanitarian conditions, Human Rights Watch said. Anti-government armed groups should allow unimpeded humanitarian access and movement of civilians away from areas of hostilities, Human Rights Watch said. In December, local media reported that negotiations were ongoing between the Russian and Syrian governments and non-state armed groups operating in Eastern Ghouta for the evacuation of the armed group Hay’et Tahrir al-Sham, previously Jabhat al-Nusra, from the besieged enclave. Any agreement should be consistent with laws-of-war protections for both civilians who evacuate and those who remain behind, and should ensure delivery of humanitarian aid to populations in need, Human Rights Watch said. The besieged enclave of Eastern Ghouta, east of Damascus, is covered by a July de-escalation agreement between Russia, the Syrian government, and Syrian anti-government groups, that calls for a ceasefire and the delivery of humanitarian aid. Syrian state media reported that Syrian government military operations against the enclave were in response to an attack on November 14 by the anti-government armed groups Faylaq al-Rahman and Ahrar al-Sham on a strategic objective, the Vehicles Administration Center, near the town of Harasta. The Russian government stated that the alliance attacks in Eastern Ghouta since November 14 have been targeting Islamic State (also known as ISIS) forces. Seven people in Eastern Ghouta told Human Rights Watch that Russian-Syrian alliance airstrikes were not limited to Harasta, where clashes were occurring, or areas where fighters were based, but extended to densely populated areas with no evident military objectives. In the three November airstrikes that Human Rights Watch documented, witness accounts and a review of video and photographs of the strikes gave no indication of any military objective in the vicinity. Non-state armed groups in Eastern Ghouta have also shelled neighboring government-held areas using mortars, causing civilian casualties and damage to infrastructure, according to pro-government media sources. Attacks using indiscriminate weapons in populated areas violate the laws of war. Human Rights Watch documented three apparently unlawful airstrikes in Hamouriyeh and Irbin in Eastern Ghouta in November and early December. While Human Rights Watch has not been able to determine whether the attacks were carried out by Russian or Syrian aircraft, only Russian and Syrian forces have been conducting airstrikes in the area. But responsibility for an unlawful airstrike does not rest solely with the aircraft or weapon used. All those taking part in the attack, including at the command level, may bear legal responsibility. The laws of war require all government forces involved in an apparently unlawful attack to carry out a credible and impartial investigation of the episode. 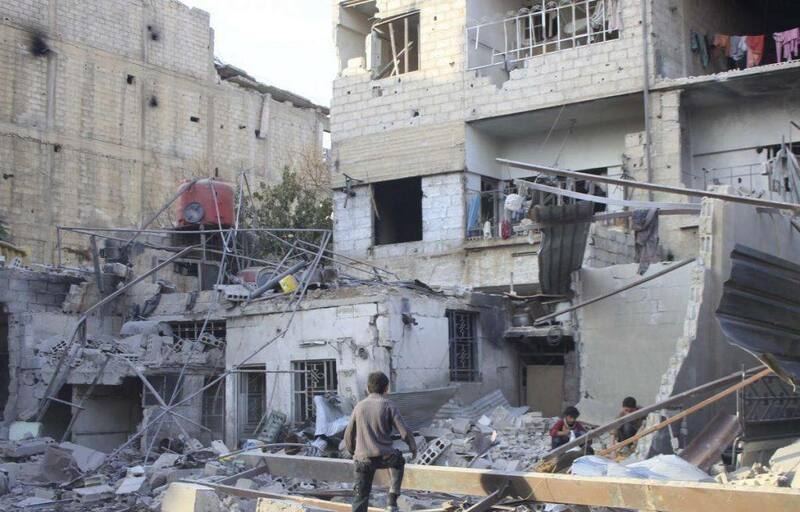 Four local residents said that Russian-Syrian alliance aircraft have struck the town of Hamouriyeh, seven kilometers from Damascus, several times since November 14. Hamouriyeh is a densely populated, primarily residential town located near the center of the besieged enclave. It is under the control of the anti-government armed group Faylaq al-Rahman. On November 19, between 5:30 and 6 p.m., Russian or Syrian aircraft struck Hamouriyeh with cluster munitions three times, according to three residents and online reports. The residents saw the aircraft as it circled above the town. One said that the strikes occurred on Hamouriyeh Square and near Hayjat Street, both residential areas. Available information indicates that the three strikes were with inherently indiscriminate cluster munitions. A civilian photographer who accompanied a Syria Civil Defense ambulance to the site of the second attack, said that when the driver, Alaa al-Din Juha, stepped out of the car, he set off an unexploded submunition, killing him. Two videos appear to show the explosion of the submunition and Juha’s body next to the Syria Civil Defense ambulance. Another civilian, Abdo Yassin, died the next day from injuries sustained in the attack, the witnesses said. The three residents said they were unaware of any military forces in the area struck, which was far from the front lines. Hamouriyeh is three kilometers from the nearest front line. I saw six who were dead immediately. The rocket fell in the middle of the road, it created a big hole. The diameter was about 1.4 meters. It went into the concrete and the explosion was huge. There were no remnants; the explosion was significant. There was a steel [iron] door to one of the residential buildings, which was heavily dented. Two other munitions struck the roofs of buildings, Hamuriyeh said. He said that the strike killed his uncle and two adult male cousins who lived in one of the buildings. The building also housed a makeshift school in the basement, which was being used because the regular neighborhood schools had been closed after earlier attacks, two residents said. The makeshift school was destroyed, but no students were harmed because school was out for the day. Hamuriyeh said several other residents also died in their homes from the strikes. Residents who documented deaths from the December 3 strikes provided a list of 18 civilians killed, including six children. Video footage from first responders arriving on the scene shows extensive damage to the neighborhood from the December 3 airstrikes. On November 23, at approximately 12:30 p.m., a Russian or Syrian aircraft carried out about eight strikes on the Eastern Ghouta town of Irbin, three residents said. Irbin is located near the edge of the enclave, less than a kilometer from the Vehicles Administration Center that anti-government armed groups attacked on November 14. The town is controlled by Faylaq Al-Rahman. Four of the strikes hit a neighborhood in Irbin with a public market and residential buildings, approximately 100 meters apart, two residents said. We heard a warplane… The munition hit the house that is immediately next door, that of our neighbors. The explosion was massive. I was at home and the sound was very loud. And I was thrown to the side. There was yelling, there was so much noise, and dust was all over the place. I couldn’t see anymore because of that. I couldn’t find my way out. The ceiling was down, doors were broken, and I couldn’t get out. I couldn’t see; the situation was horrifying. The strikes killed three civilians: a shop-owner, and two children, and injured at least 20, according to media reports and witnesses. Syrian government forces and associated militias have besieged Eastern Ghouta since 2013. In April 2017, government forces retook the Barzeh and Qaboun neighborhoods of eastern Damascus, closing off smuggling tunnels between the neighborhoods and further restricting the movement of aid into and evacuation of people with urgent medical needs out of the enclave. The government further tightened the siege on October 3 by severely restricting the use of al-Wafideen, the only commercial trade-crossing with the enclave. The closure of the tunnels and the crossing made prices of goods in Eastern Ghouta skyrocket. An aid worker said that in November the one-month cost in Eastern Ghouta of a “survival minimum expenditure basket” (SMEB) – a unit used by humanitarian organizations to measure basic survival needs per household – was approximately US$700. A UN inter-agency assessmentfound that by mid-November, the price of a bundle of bread in Eastern Ghouta was 85 times the price in nearby Damascus; in August it was 24 times the Damascus price. Residents estimated that the average worker made only between US$50 and a US$100 a month and said that the majority were unemployed. The siege is killing us. A man must work two jobs to scrape together enough money to put one meal for his children a day, if that. It’s almost as bad as it was in 2013-14. Then, we got to a point where we used to take the feed that we saved for the chicken – very harsh, inedible stuff – and eat it. The government allows only one well-known merchant to use the al-Wafideen crossing to bring merchandise in, residents and aid workers said. They said that in November the merchant was required to pay a tax of approximately 2000 Syrian pounds (US$4) for each kilogram of material brought in, making goods even more expensive. The Syrian government has restricted the number of UN aid convoys to the area and the amount and types of goods that can be delivered. Humanitarian workers said that the convoys that entered since September did not contain aid that was sufficient for the population they were intended for and often did not meet their needs. Even when permission is granted, administrative and security issues often result in excessive delays, a UN official based in Damascus said. Since the tightening of the siege, there have been many reports of harm to civilians from a lack of adequate food or medicine. The Syrian Network for Human Rights said that at least five civilians died as a direct result of lack of food or medicine between November 14 and 28. On November 2, local media reported that a one year-old girl named Maram, who had been born with one kidney, needed medicine that was unavailable and surgery that could not be performed within the enclave. The doctors said that the lack of medicine and adequate medical care has made people desperate. We left no stone unturned trying to get her out, to treat her but to no avail. No one would let her out, or help us. She died. Her parents gave birth to another girl, around a month or two ago, initial tests indicate that she has the same sickness. Her father, this time, when I wanted to discuss treatment with him refused outright. He said he doesn’t want to discuss treatment anymore, he doesn’t want to treat her anymore – there is no point. We’ll wait to die together, he told me. On the 18 or 19 [of November], there was an airstrike and a relative of mine was injured. A young guy, 33 years old with children, whose hands had to be amputated. I was the one to treat him, but I didn’t realize it was my relative. I didn’t realize until I got home, and my wife told me a relative of mine had to have his hand amputated. I asked her, was it the one with the two hands amputated? She said yes. I treated him but I was so overwhelmed with the number of patients, I didn’t even recognize him. This is our lives now. International humanitarian law, or the laws of war, which apply to the armed conflict in Syria, prohibit attacks that target civilians or civilian property, that do not or cannot discriminate between civilians and combatants, or that cause harm to civilians or civilian property that is disproportionate to any anticipated military gain. All parties to the conflict have an obligation to take all feasible precautions to spare civilians from harm, and not to deploy forces in densely populated areas. The laws of war do not prohibit siege warfare so long as the purpose is to achieve a military objective and not to starve or cause disproportionate harm to the civilian population. Civilians may not be forcibly displaced unless their security depends on their evacuation. A party that imposes a siege that has the effect of starving the civilian population has an obligation to provide access for humanitarian aid for civilians in need and not arbitrarily interfere with it. Parties must also ensure the freedom of movement of humanitarian workers, which can only be restricted temporarily for reasons of imperative military necessity. Individuals who commit serious violations of the laws of war with criminal intent – that is, intentionally or recklessly – may be prosecuted for war crimes. Individuals may also be held criminally liable for assisting in, facilitating, aiding, or abetting a war crime.